2017 Fan Fair X Map Available! 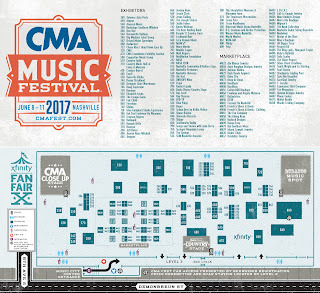 The official 2017 CMA Music Festival Fan Fair X Map has been released and is available here! Members may download our custom version in pdf format so that it will easily print out on a 8.5" x 11" sheet of paper without having to shrink so much that you can't read the directory info! Members may also download a pdf spreadsheet of the Fan Fair X Directory sorted alphabetically and by booth number!